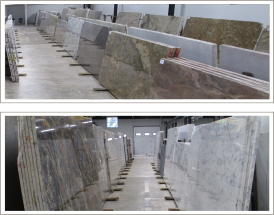 We carry a rotating stock of marble and exotic granite slabs. Our selection gallery has over 100 varieties of natural stone to choose from. Our 8,400 square foot, fully climate controlled, indoor warehouse is stocked with premium material sourced from around the world. Once you’ve made a selection we can provide you with pricing information and coordinate the fabrication and installation details. From start to finish, Miami Circle Marble & Fabrication can coordinate all the details of your high end project.